A creative departure for me today. Anyone who knows me well will know that I do NOT stitch. I have always been incapable of sewing a straight line even with a machine. But, I look at pieces that are stitched and wish I could do that myself. A nice compromise was to use the fabric paper I made with Alison a week or two ago. I punched a heart out of it and made a background piece. Lined both with foamy wrapping stuff and then played around, adding beads and wonky stitiching ... quite deliberate you understand ... Ahem! Now its done, I enjoyed it so much that I want to do more. I'm thinking of making a fabric paper patchwork quilt next. I'm not sure my patience will last the course tho'! This is awesome, Penny! Fabric paper, how's that made? 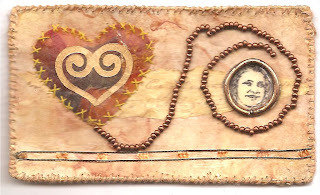 Love your stitching and beads Penny! This is totally stunning - wow a quilt would look so amazing. I can't wait to see how you progress with that! Penny, I'm all about beads and wonky stitching. Nice to see you branching out. I say keep it up! Is this postcard size? She did, she did and it is beautiful. I am like you, not much of a seamstress. I'm glad you attempted sewing-it looks great and adds so much texture and interest. It is very beautiful, Penny! The stitches look great, I admire your "willpower"! 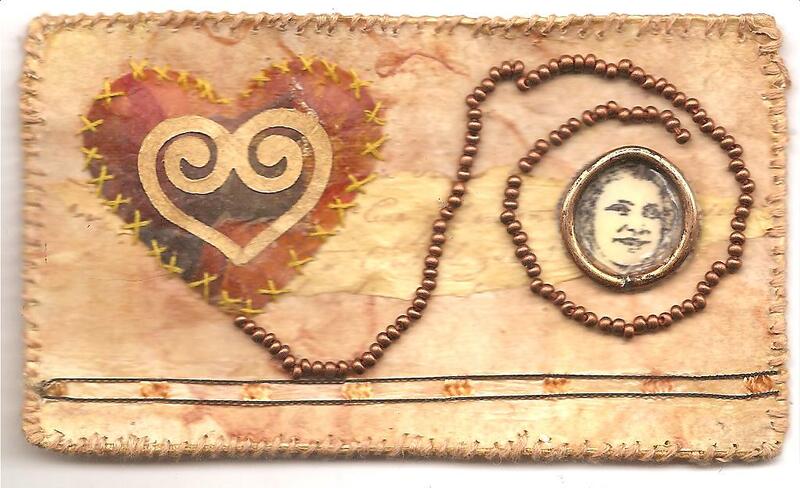 This turned out wonderfully, Penny~ the stitching adds a whole new element to the work! He He I can't sew but these days I think it doesn't matter ! Looks pretty professional to me! What is fabric paper??? From another fabric/sewing challenged person, this is fab!